I frequently experiment with new ideas for vegan sandwiches, especially sandwich spreads. They make school-time lunches a breeze and they often double as a dip for veggies or chips. With my oldest daughter, it's often a dip for her spoon. I've made this Artichoke Dip a few times. It's got a subtle white bean base and just creamy enough, while avoiding a calorie overload. And the artichoke flavor shines through. I've also made this Spinach Dip. With the stronger spinach flavor, I could use a whole can of white beans without tasting beany. But my girls turn their nose up at all the spinach. This iteration, blending the two is the perfect mix. It's healthy enough to use it in a sandwich, its got great flavor and my girls love it. In fact, it's my favorite of the three. Add the sauce ingredients to a blender and blend thoroughly, until very smooth. To the blended sauce, add the cooked spinach, minced water chestnuts, minced artichokes, and jalapenos. Pulse the blender to combine and refrigerate until the sauce thickens, at least a couple of hours. The dip is better if kept overnight. Yum, I like the use of beans in this! I wonder if you couldn't bake/warm this as well? 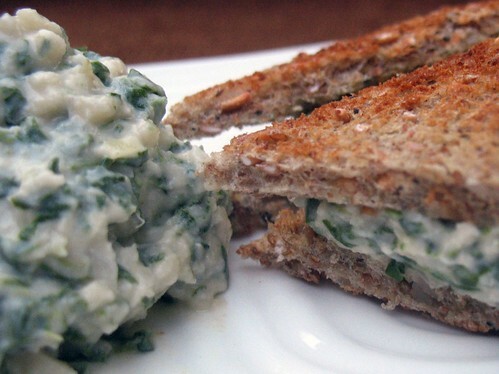 I used to love hot spinach artichoke dip years and years ago...it sounds great! OMG looks amazing! Can't wait to try it! oh man I cant WAIT to try this! Oh, this looks like a winner! I think this is an after work quick dinner this week! oh man, I forgot how much I used to love this dip as an omni! I have got to try this. YUM! I just made spinach dip myself, I love it!